Goals from Robbie Simpson, Ollie Watkins and Joel Grant secured Exeter City all three points on their trip to Colchester United. City made four changes from the side that lost to Portsmouth in their last League Two match. Jordan Tillson, who fractured his ankle in that game is out until Christmas, while Troy Brown failed a late fitness test and was only able to take a spot on the bench. Liam McAlinden and Connor Riley-Lowe also dropped out of the team, while new loan signings Luke Croll and Jack Stacey took their place in the side. They were joined by the recalled Jordan Moore-Taylor and Robbie Simpson, who had both spent spells on the sidelines through injury and illness. Ethan Ampadu kept his place in the centre of defence and made his first start for the club away from home, despite him being 13 days away from his 16th birthday and facing the prospect of going back to school on Monday after a summer break from his GCSE studies. City got off to a great start as Robbie Simpson side-footed the ball home from close range after Jordan Moore-Taylor had headed a cross from Lloyd James against the inside of the post. It was alert play from the Grecians’ striker as he reacted to the loose ball quickest to fire home, but he will feel he should have put his side two goals to the good moments later as Stacey rolled a pass to him in the area. However, Simpson got underneath the shot and the ball flew over the crossbar. City were pegged back moments later as Sammie Szmodics rifled the ball home at the back post after the Grecians had failed to clear a free-kick into their box. However, City passed the ball around nicely in the first half and had another chance to go back in front as Watkins found Jake Taylor on the edge of the area. His shot was well saved by Sam Walker in the home goal though. And it was United who took the lead just before the break as a corner was headed home by Kurtis Guthrie, with the ball looping over Bobby Olejnik’s head and into the top corner. However, City battled back superbly in the second half as Watkins put them back on level terms. Again it was neat buildup play that led to the goal as Taylor fed the ball to Watkins on the edge of the area and he produced one stepover before firing the ball into the bottom corner. That is the way it stayed until 23 minutes from the end when City took the lead. Watkins was again involved as he played the ball out to Stacey on the right and the Reading loanee delivered a cross to the near post where Taylor flicked the ball on for Grant to fire home at the back post. City had some nervy moments to contend with in the final 15 minutes of the game as Troy Brown blocked a goalbound effort from Tarqiue Fosu and Szmodics hit a shot against the outside of the post. The U’s also had a goal chalked off for offside when Denny Johnstone fired home with five minutes left. 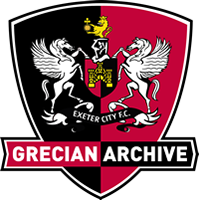 However, the Grecians defended in numbers and got their heads and bodies in the way – even when the home keeper Walker came up for a late corner – to hang onto the points. 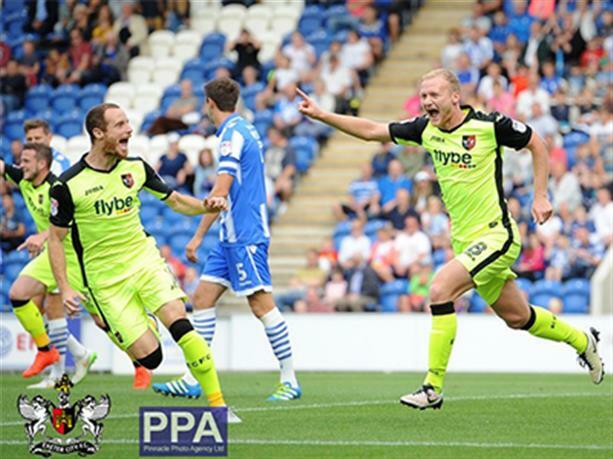 Exeter City (4-3-3): Olejnik; Sweeney, Ampadu (Grant, 60), Croll (Brown, 76), Moore-Taylor; Taylor, James, Harley; Stacey, Simpson (Oakley, 83), Watkins. Subs not used: Pym, McAlinden, Riley-lowe, Butterfield.